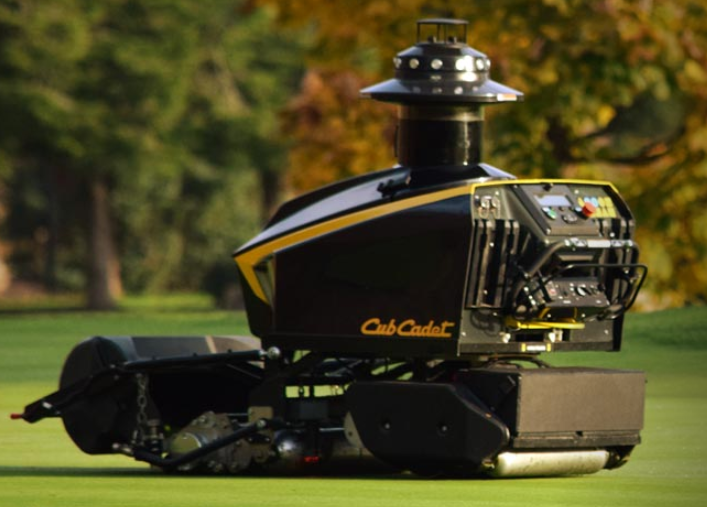 If mining operations will soon be autonomous, can golf course maintenance be far behind? Here's an image of what to expect. Please consider the Cub Cadet. "The RG3’s impact to our putting greens has exceeded my expectations. We are achieving higher clipping yield, more consistent greens speeds and smoother putting surfaces with less manpower," says John Shaw, CGCS, Valley Brook CC. Expect golf course mowing positions to vanish within a few years. Many yard work service positions will vanish as well. Zero-degree mowers are in widespread use. It will not take much to equip them with self-mowing capability. So instead of a homeowner farming out mowing (or mowing himself), envision a system where the homeowner maps the perimeters of the lawn and the perimeters of any flower beds that need to be avoided, and the mower does the rest. Rather than pay someone to mow the lawn twice a week, a fully autonomous mower would pay for itself in a year or two most likely. And the higher the minimum wage, the faster the payback of purchasing such equipment rather than hiring someone to mow your lawn. Accessories to fertilize the lawn will come with the package. Of course perimeter settings can move from machine to machine. This will enable mower settings transfer to equipment such as aerators. Need aeration? Just have someone drop off an aerator, transfer your perimeter settings to the machine, and off it goes. Human operators need not apply. The lawn service companies that remain in business will consist of drivers that drop off the equipment and perhaps make the initial perimeter settings, rather than human workers that actually mow or aerate lawns. And of course, given that autonomous vehicles of all sorts are on the way, eventually human drivers will not even be needed to get lawn maintenance equipment to the location. One reader commented "Robot lawn mowers have been around for about 10 years. It's the same technology as the iRobot vacuums that came out 20 years ago." I responded "How well did those devices work and how much did they cost?" I actually doubt the technology is the same. Regardless, it is obvious such technology is making huge inroads at a remarkable pace now. For whatever reason (cost or functionality), 20 years ago no one had such devices. Fully autonomous vehicles of all sorts will be common within a few years.